Using the Leadbelcher base spray made painting a lot quicker as a very large bart of this model is just Ironbreaker layered over Leadbelcher with Nuln Oil shade and Runefang Steel edge highlight. I tried using the Mephiston Red spray on the non-metallic shell, but I found the colour came out a lot darker than the potted paint and I had to coat over it a few times anyway. The stripes were somewhat intimidating to do. I started out trying to use masking tape to divide the sections bit this ended up being messier than freehanding it with a long lining brush. The large white section in the middle that denotes the princeps rank was a little daunting as I have always had trouble with the White Scar paint. In the end I painted it Ulthuan Grey then layered/highlighted it with White Scar. I think some of the transfers are slightly rotated and off centre, but it is not too noticeable unless you are looking for it. There is some Blood for the Blood God technical paint splattered over the chain sword which I applied by flicking it from a thick brush, and I really like the effect it gives. The base was done with crackle paint layered over red and orange streaked base and topped with black paint. If there are any ideas for extra bits of scatter to make it look more interesting, I would love to know as I am coming up blank. 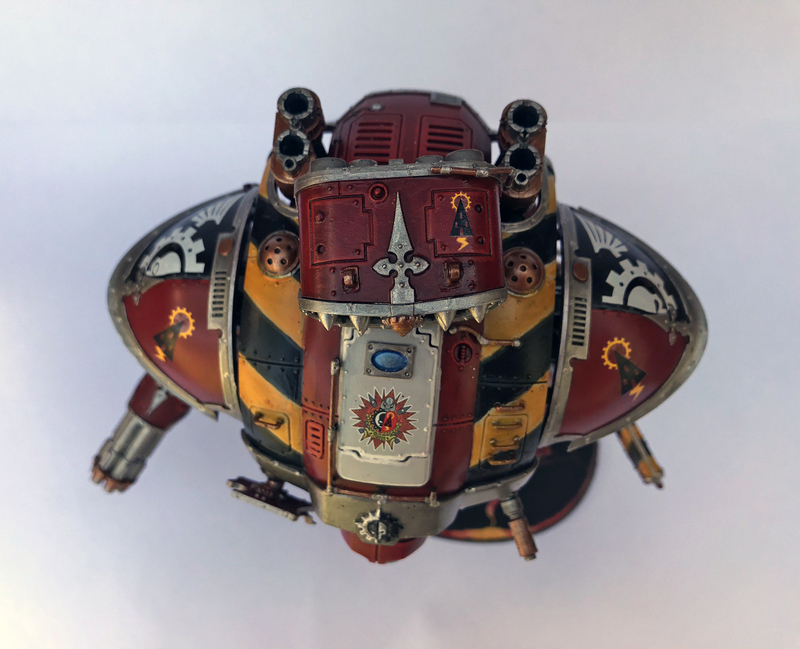 Overall, I am very happy with how this model turned out and I am looking forward to painting the Knight Princeps model when my preorder arrives next week. Thank you for reading! That looks great! Impressive amount of magnetization work, too. Mephiston red spray, I think might be a closer match for Khorne red, but I’m not sure. The GW sprays are too expensive for my taste, so I don’t have any experience with them. Cavalier over at Frontline Gaming turned me on to a good trick for white: Start with Celestra grey, then cover all of that except the crevices and such with Ulthuan grey. You don’t even need to go to White Scar/Ceramite white in most cases, because the Celestra grey makes for enough contrasting shading that the eye registers the Ulthuan grey as white. The base looks fantastic. I wish I could manage to get crackle paint to work that well for me. As far as little bits to mix it up a bit, what I would do is break up more cork into really tiny pieces, small enough that there’s only one flat side, which gets glued to the base, or to a flat layer of cork. It also helps if you have a couple of different sizes of cork available to mix it up more, and make it less obviously sheets of cork. I might also give the rocks some very light highlights in a dark red/orange. Just enough to give them some definition, not so much that it’s really consciously noticeable. Even without that, tho, that is excellent work, and I look forward to seeing the whole lot of them together! I will try that white trick! It is very interesting how our eyes process things relating to colour. The varying sizes of cork sounds like an excellent idea, I will have a look through my materials shelf and see if I have some different sizes of cork. Thank you very much! 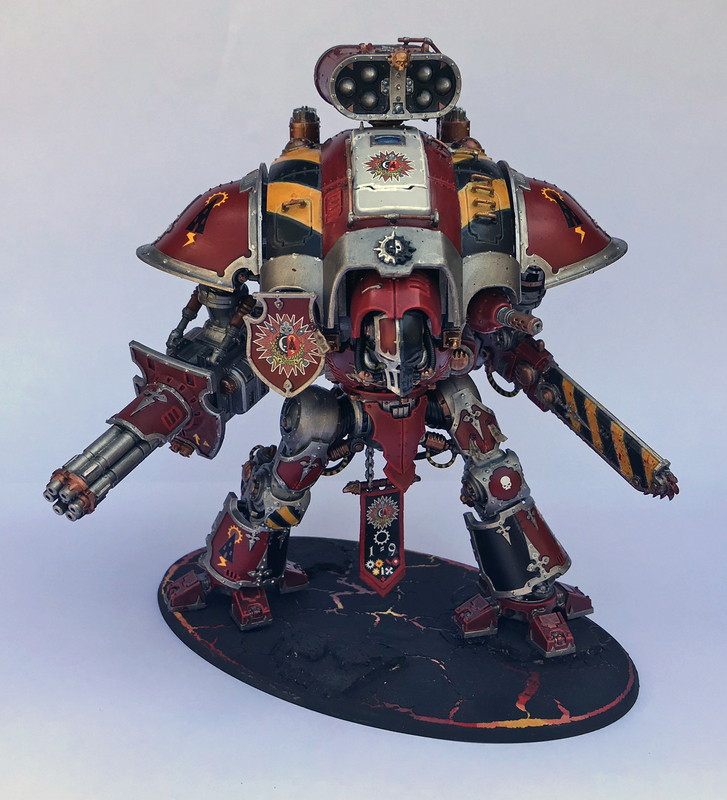 This looks great I have 3 knights to build and 2 to paint myself (converting one for a friend for Christmas). Seeing really nice work like this is a great motivator. Really lovely stuff.